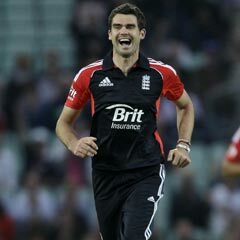 London - England pace bowler James Anderson has been called into his country's squad for the Twenty20 series against South Africa as cover for Steven Finn. Anderson has not played for England in the shortest form of the game since his appearance against South Africa in a match at Centurion in November 2009. The 30-year-old is not part of the England squad for the ICC World Twenty20 tournament which starts in Sri Lanka later this month. But Finn missed the final one-day international against the Proteas in Nottingham on Wednesday after being hampered by a stiff back and that convinced the selectors to draft in Anderson. The England and Wales Cricket Board confirmed the news of Anderson's call-up in a statement: "James Anderson has been called into the squad for the T20 series against South Africa as cover for Steven Finn who has a stiff back." England face South Africa in three Twenty20 internationals, the first is at Durham on Saturday, the second at Old Trafford on Monday and the third at Edgbaston on Wednesday.